Dungarvan Harbour is a wide eastward facing coastal embayment, located in County Waterford on the south coast of Ireland. The harbour which covers an area of 6.9km2 is almost perfectly symmetrical and is flanked on either side by the protruding bedrock headlands of Ballynacourty Point on the north side and by Helvick Head on the south. Freshwater feeds into the harbour via the Colligan River, which flows through Dungarvan town on the north western side of the harbour. The central portion of the harbour comprises mud, silt and sand flats which dry out at low tide and an exceptionally straight sand spit at Cunnigar. Salt marshes occur in pockets around the harbour edge and there is a narrow sand or gravel beach in places also. Cunnigar spit formed as a result of wind erosion and deposition over the millennia since the Ice Age and several large dunes have formed across it. Dune slacks occur between these, which are low, narrow, marshy localities. The spit is 2.6 km long and almost closes the harbour at its northern end. The water temperature range for the bay is approximately 4-17ºC, with the lowest temperatures recorded between December and February and the highest temperatures recorded in July / August in the oyster aquaculture area. Due to the shallow nature of the area where the oysters are grown greater fluctuations are often observed in extremely warm or cold conditions. The highest temperatures recorded in 2017 occurred in July when temperatures reached 20 to 22 ºC in the water on several occasions. The coldest temperatures were recorded in Early January of between 4 and 5 ºC. Water temperatures normally reach 16ºC in Dungarvan Harbour between the first week of June and the second week of July but prolonged periods above 16ºC are not observed every year. This has a significant influence of the outbreaks of OsHV-1µVar observed in the bay. Some years no outbreaks are recorded at all. The salinity range for the bay in 30-35ppt and depths around the oyster culture area range from 0-5m. During heavy rains freshwater run-off can often be observed on the surface of the water but wide fluctuations in salinity are generally not seen in most of the oyster growing area. The only species cultivated in Dungarvan Harbour are Crassostrea gigas. C. gigas cultivation began in the harbour in 1985. Spat sourced principally from France are grown in bags on trestles in the intertidal zone. The oyster aquaculture sites are located on the sand flats to the east of Cunnigar spit. Oyster production levels in the last 5 years were approximately 1750T / annum. The bay also supports a wild cockle fishery which is located just inshore of the oyster aquaculture area. Mortality of spat and juveniles associated with OsHV-1µVar was first recorded in the bay in 2008 and has been recorded almost annually since that time (Morrissey et al., 2015, Clegg et al., 2014; EU Shellfish NRL Annual Meeting Report, 2012). Levels and the numbers of batches impacted vary within and between years and the temperatures reached in any given years is believed to have an impact on this. More recently mortality of adults and half grown oysters have been reported (EU Shellfish NRL Annual Meeting Report, 2014). An increase in mortality and the fragility of the oysters during the summer period has been reported since about 2012. 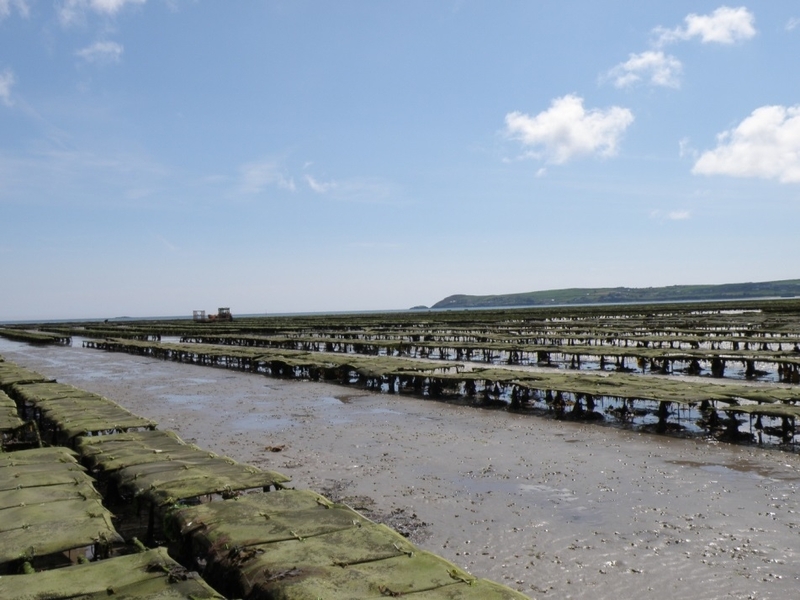 Onset of Mortality in these oysters begins around May and continues through until October with cumulative mortality for the summer period generally reaching between 30 and 50%. Handling of oysters from April onwards appears to lead to increased mortality in stocks. Vibrio aestuarianus has been isolated regularly during these mortality episodes and longitudinal studies carried out under a national funded research program (Reposus) in 2015 demonstrated a link between rising mortality and increasing levels of V. aestuarianus in the oysters. The pathogenicity of isolates of V. aestuarianus collected from Dungarvan Harbour has been demonstrated through infection trials and sequencing studies have placed isolates in clade A.